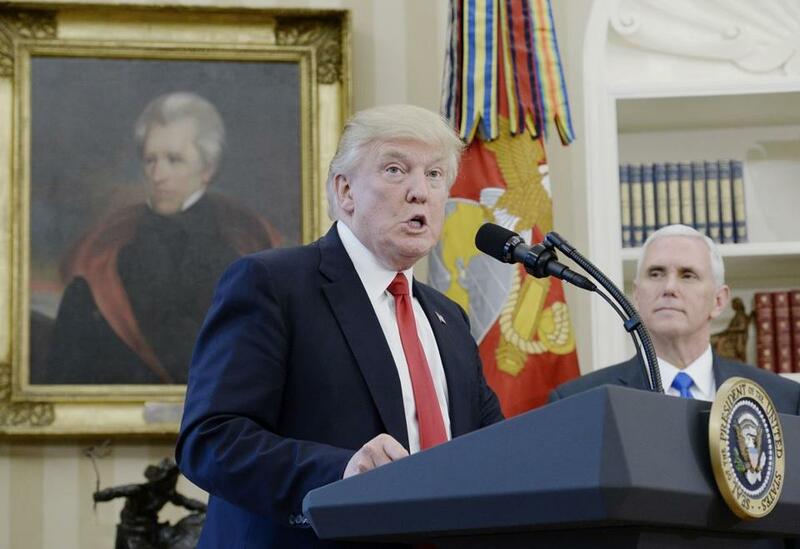 President Donald Trump and Vice President Mike Pence. Trump and his senior aides spent much of the day on the defensive, parrying the latest reports that senior administration officials may have acted improperly in the House Intelligence Committee’s investigation into Moscow’s meddling in the US elections and possible links between Trump’s campaign and Russian officials. White House press secretary Sean Spicer defended the actions of three senior White House aides who, according to media reports, helped facilitate the visit of the committee’s chairman, Representative Devin Nunes, Republican of California, to the White House grounds last week to view classified intelligence documents. ‘‘What he did, what he saw, who he met with was 100 percent proper,’’ Spicer said of Nunes. Nunes later briefed the president on the information and declared publicly that the documents showed Trump campaign aides were swept up in US intelligence surveillance of foreign nationals. That prompted the president to say he felt ‘‘somewhat’’ vindicated in his unsubstantiated allegations that President Obama had ordered a wiretap on him. Trump, meanwhile, weighed in again Friday via Twitter by suggesting that he supported a request by his former national security adviser, Michael Flynn, for immunity from prosecution in exchange for offering to testify in the probe. ‘‘This is a witch hunt (excuse for big election loss), by media & Dems,’’ Trump wrote. Spicer said the White House was not concerned that Flynn might reveal damaging information, even though Trump fired him in February over revelations Flynn misled senior officials, including Vice President Mike Pence, over his communications with Russian Ambassador Sergey Kislyak. But Representative Adam Schiff of California, the ranking Democrat on the Intelligence Committee, called it a ‘‘grave and momentous step’’ for a national security official to seek immunity. “I never, ever briefed a US congressman on anything in that capacity, and I’m not aware of anyone who did when I was there,’’ said Michael McFaul, US ambassador to Russia in the Obama administration. For the White House, it was another chaotic day in which its attempt to regain control of the conversation — this time through two executive orders on trade — was relegated to an afterthought in Washington. Amid mounting attention on Trump’s frequent weekend jaunts to his winter retreat in Palm Beach, Fla., aides said the president would remain in Washington this weekend holding meetings. Trump has a lot to prepare for, with three world leaders — Egyptian President Abdel Fatah al-Sissi, King Abdullah II of Jordan, and Chinese President Xi Jinping — due to meet with the president next week.